These memory foam chair pads fit perfectly with the HERCULES COLORBURST folding chairs I purchased from Overstock in purple. The eggplant color works as if they came together. Add a pop of color and comfort to your dining area, breakfast nook, or sporting event with these trendy chair pads. Each pad is crafted from a cozy layer of memory foam with a colorful cover that has been embellished with a textured diamond pattern. The non-slip backing prevents the cushions from sliding around, while the tie-free, lightweight design allows you to easily transport the cushions so you stay comfortable whether you're at the table or outside. Dimensions 16.0 In. X 16.0 In. X 1.0 In. These pads only fit on a very square chair. My chairs have an angle at the back that won't accommodate these pads. I purchased two sets of the dark red, and they're as expected. They are not very soft and cushion-y, but they add a nice extra bit of padding to either thinly-padded leather seats or hard wooden chairs. They have somewhat of a grip, but do slide a bit when you stand up. I recommend buying a set of elastic sheet straps if you're looking for a way to "anchor" the pads - one strap can be used for each pad, run from side to side or front to back under the chairseat. Works like a charm. Happy with this purchase. We are using them for metal folding chairs at church. They are comfortable, durable and look good. Very happy with the purchase. While the Memory foam "promotion" may be true (who really knows what's inside? ), these are disappointing - very thin. I have other memory foam cushions that actually have the delayed compression that one expects with memory foam. These feel like a regular cushion and are a little smaller than expected. The non-slip backing is good. Color choice is good. These chair pads are handsome, with an interesting woven texture lovely color choices. These square pads fit my dining room chairs perfectly and are very comfortable. The rubber backing prevents slipping. 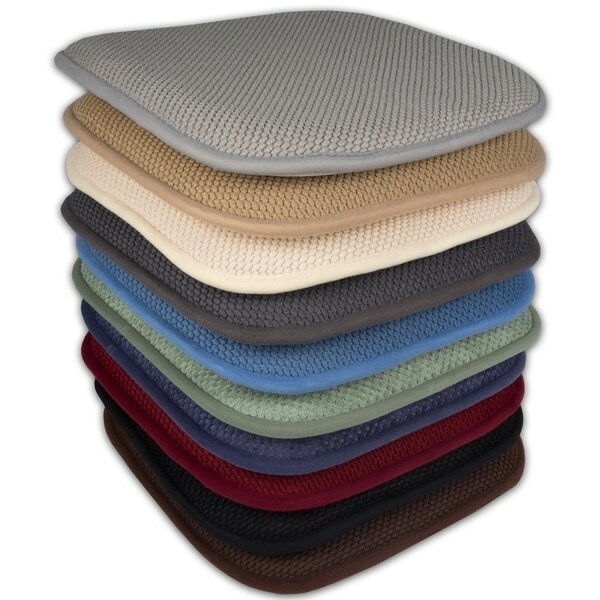 I love these chair pad/seat cushion with the memory foam and amazing Non-slip backing. They look awesome on my Louis Ghost Chairs, and with the assortment of colors to choose from... it made it so easy to fix my décor. I love the Memory Foam back to this chair pad- it is very comfortable to sit on! The color is also exactly what I wanted- I ordered the dark gray. Very nice chair pads- especially for the price! The quality was better than I expected. It has the non-slip backing which I love~I got dark brown color and it looks good on my dinner table chairs. These seat cushions are awesome. They have a non-slip bottom so they stay perfectly on my wooded chairs. The memory foam is nice thick and feels great when sitting down to a long dinner with family. I like this product because it stays on the chair. The non-slip backing is the key that makes the pad not moving. Comfortable seat. Not very thick, and they don't grip the chairs as advertised. Paid over *** for 6 of these cushions...not pleased at all, and definitely not worth the price! Love these and one of the few tie-less chair pads I could find in gray. The are very comfy and cushy without being too thick. They were out for a little while but got them back in stock quickly. wish that it was more contoured on one side to fit the chair better. It is a rectangle so doesn't fit chair seat exactly. These were purchased to go on four Ira wicker chairs, and they not only fit perfectly, the non-slip grip back keeps them perfectly centered. LOVE The memory foam. No need for ties because it won't slip. The non slip on the bottom holds the cushion. Although there isn't anything I can do about it, it isn't quite the shade I wanted. I wanted more red. Oh well~ Great quality though. Thick and comfortable. Fits nicely on the chair. These are comfortable but they were not made to stay in place. Nice. Just your average seat cover. Look great and work well. Super spongy and firm. The backing sticks like glue to my wood bench which it what i needed. Waffle comb fabric is nice but snags easily. I bought these for metal chairs I had gotten to help with comfort while sitting for extended periods of time. They work great as the bottom of the cushion has a gripper type material that keeps them put on the chairs they are a little big for the chairs but I just wedged them in the back and they work fine! Very pleased with this purchase. I selected the grey. They are very neutral, in color, don't show dirt easily, and stay in place well. These work perfectly, in my ladder back oak kitchen table chairs. I would certainly purchase them again. They arrived in the time quoted. "Are these cushions good for outdoor resin chairs"
I'm using them indoors. They would probably absorb water when used outdoors as they are foam covered with fabric. "How thick is the memory foam? Is it solid foam or eggcrate type of foam?" 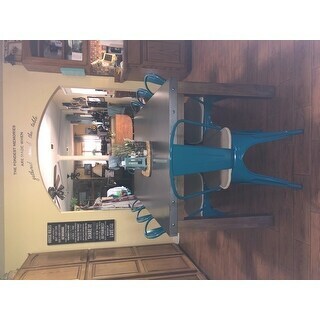 They are solid but very thin - I bought them hoping they would make my kitchen chairs more comfortable to sit on but they are just too thin to be noticed! They may be 2 inches thick to start with but quickly flatten and don't spring back. Solid foam. Mine are pretty thin, about 3/4 " in the 'Tan' Color. But they are what I wanted, a little cushioning for tan plastic chairs. We have been putting 2 in each chair which provides good cushioning. Even though they are not as thick as I would like, they are nice quality and look good. I wouldn't, they'd be all lumpy or out of shape. Yes, they are washable but I would suggest drying them on low or delicate. They retain their shape well. Yes and I love them. Have 6 kids and they are easy to keep clean! "Will these fit in the Eames style chairs - 2xhome - Set of Two (2) - Eames Style Armchairs - Natural Wooden Legs - High Quality Dining Room ... ITEM# 18975849?" "will the non-slip backing ruin my wooden chairs?" No, these will not ruin your wood chairs. I have them on wooden breakfast stools and they have been there for months with no sign of any problem. I have them on my wooden chairs for several months. They do no damage. "It looks like you have in gray but I don't see gray on the drop-down. Is gray available?" The grey is not currently in stock. "We need 72 cushions Do you have that many in stock & is there a discount for large orders? Colors either brown or gray would work but need all same color"
Hello zoe, please contact Overstock Customer Care at 1-800-The-BIG-O (843-2446). Thanks for shopping with us!